Renee Rothberg | Yumtritious Eating! I am in the process of working my way into eating vegan. It’s a process because I like eggs, mainly because they are quick to prepare and versatile. I asked Spirit for help with my transition, and I received this egg substitute recipe that was relatively quick to prepare and tasty–not amazingly tasty, but tasty enough to be included in Yumtritious Eating! I will be receiving more scramble recipes to help me with my move to veganism. In a bowl, mix the mustard and water, then mix in the tahini paste. Dice the radish (equal to 3-4 Tbsp), then add it to the bowl and mix it in well. Add the red lentil flour to the bowl and mix it in well. The mixture will be crumbly. Dice the tomato (equal to 3/4-1 cup), then add it to the bowl and mix it in well. When the oil is hot, spread the mixture thinly in the skillet so that as much as possible is touching the skillet. Leave it to cook for 4 minutes. With a spatula, flip the mixture over and continue cooking for 2-3 minutes. Remove the skillet from the heat, and immediately scoop the mixture onto a plate. The chicory I bought is grown near my home in the middle Galilee, and it looks like the varieties called Catalogna and wild chicory. It was full of soil so I washed it well using the instructions for “Cleaning leafy greens and other dirt-filled veggies” on the Food Prep Tips page. Chicory is very nutritious, so it’s a worthwhile green to learn to work with. Once I got it home, I had no idea what to do with it so I asked Spirit for a yumtrititious recipe. Since it’s cold outside, I wanted to make a warm dish, and I was hungry so I wanted a recipe that I could make in under an hour. Here is the recipe that Spirit gave me. Thanks, Spirit! 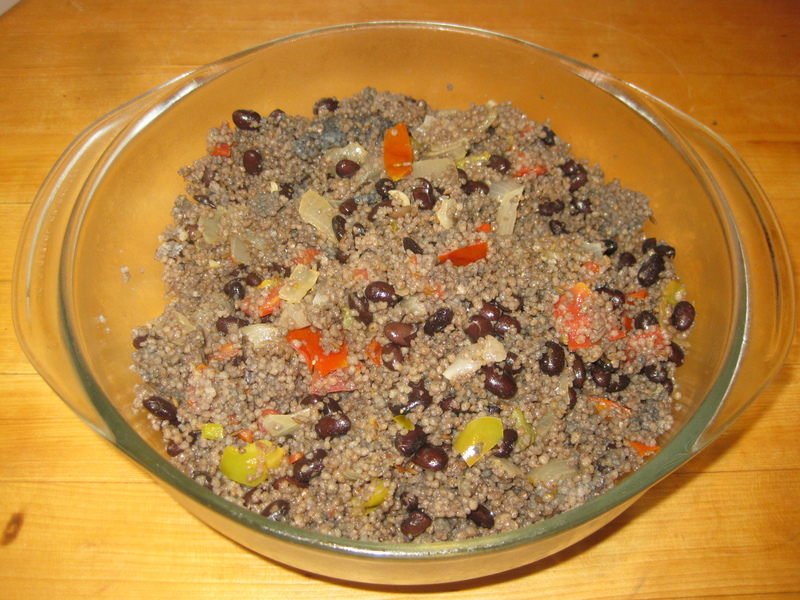 The recipe has two parts: the chicory part and the lentil-hazelnut part. I’ll present the instructions for each part separately, but I made them at the same time. Mix in the chopped hazelnuts and continue cooking for 5 minutes. Stir regularly to keep the mixture from getting too stuck to the pot. Turn off the heat, then add the mustard powder and pepper. In a large pot, saute the onions in olive oil until the onions are soft (5-6 minutes). Add the chicory and saute 7 minutes. Stir in the salt and cardamom, then add the milk substitute and stir until the milk is completely mixed in. Remove from heat and add the lentil-hazelnut mixture. 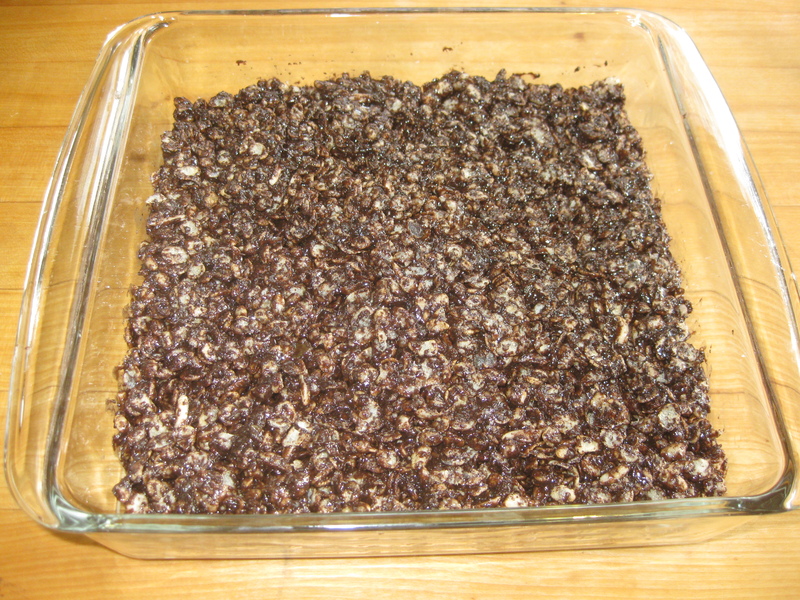 Chocolate and crispie rice cereal (brown rice, of course) are a yummy dessert combination. Peanut butter binds them and agave, coconut, and yellow raisins sweeten them. Slivered almonds add extra crunch. This dessert satisfies the sweet tooth and nourishes the body at the same time. Yumtritious! In a medium size bowl, mix the peanut butter and agave until smooth. Add the coconut, raisins, and almonds and mix. 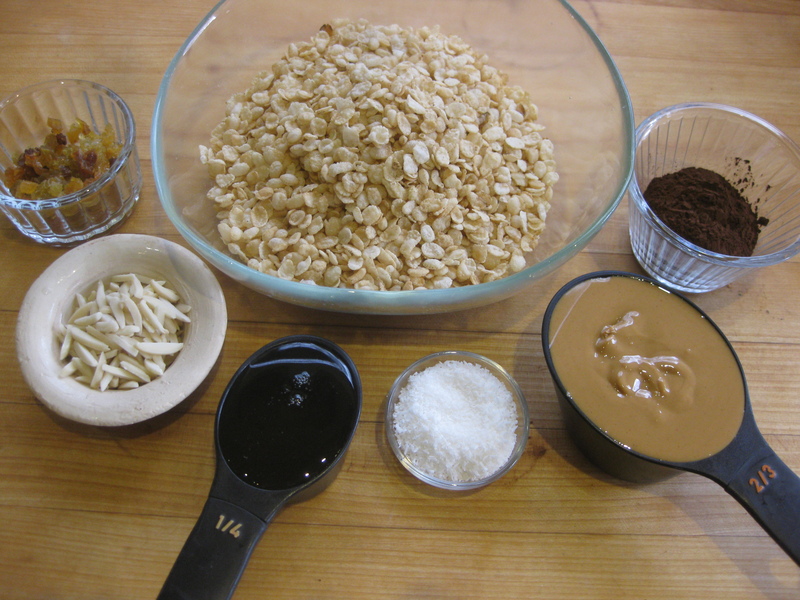 Add the cereal and mix until all the cereal pieces are well coated. Place the baking dish in the freezer for 15-20 minutes, then remove it for cutting. The mixture will be firm, but not frozen and easy to cut into squares. Cut the mixture into the square size you prefer. Return the baking dish to the freezer or refrigerator to firm up more.